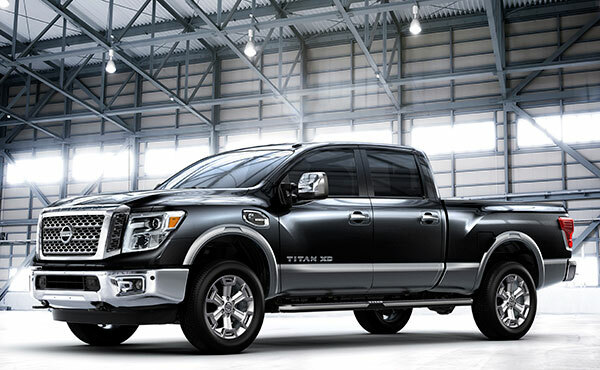 Titan is not exactly a household word in the world of full-size pickup trucks, but Nissan hopes that the second generation will give its half-tonner a little R-E-S-P-E-C-T.
And while hope is not a strategy, there’s some foundation for this, because the redesigned 2016 Nissan Titan will have something its competition does not. More on that in a minute. Even though it possessed a number of strong suits, such as solid construction, plenty of power, plenty of capabilities, Nissan Titan has been all but invisible in the full-size pickup derby. The fact that it’s been essentially the same since its debut for the 2004 model year hasn’t helped. Fifth among five, the Titan’s share of the robust full-size pickup market now hovers at about 1 percent, a situation that would cause many companies to pull the plug. But rather than give up, Nissan is renewing its challenge to the pickup establishment with this all-new truck that the company characterizes as the toughest, most rugged-looking of them all. Really? Your call there. But be that as it may, the revitalized 2016 Titan will have one major bragging point: the only diesel V8 engine option in its class. The compression ignition edge may seem modest at a glance, two more cylinders than the Ram 1500 turbodiesel V6, and 5.0 liters, versus 3.0. But with 310 horsepower and a whomping 555 pound-feet of torque, the new Cummins turbodiesel V8 allows the Titan to straddle the border between half-ton and heavy duty. Nissan claims a maximum payload in excess of 2000 pounds, and max towing over 12,000 pounds, depending on equipment. Nissan furnished no EPA numbers for the new engine when it unveiled the 2016 Titan at the January 2015 North American International Auto Show in Detroit. However, Nissan executives did say they anticipate a 20 percent fuel economy advantage versus a naturally aspirated gasoline V8 of comparable displacement. The current Titan V8 is Nissan’s gasoline 5.6-liter, with EPA ratings of 15/19 mpg City/Highway. Although Nissan refrained from details, a gasoline V8, probably the current 5.6-liter, will continue in the Titan lineup, which will also include a V6 for the first time. But the initial batch of new Titans, due to reach showrooms, probably starting in October, will all be crew cab versions, propelled by the new Cummins diesel. The other engine choices won’t come along until later. This also applies to body styles. Extended and standard cab versions will join the lineup sometime in early 2016. All engines will be paired with a new Aisin 6-speed automatic transmission, and four-wheel drive will continue to be an option. Nissan’s goal with the Titan D is to create and exploit a mini-niche with a truck that will please buyers who occasionally want heavy duty capability but are reluctant to step up to one of the massive HDs from Chevy, Ford, or Chrysler’s Ram division. That may sound like a pretty tight marketing window. But when you’re clinging to a one percent presence in the market, there’s basically no place to go but up.